We have a FREE HubSpot Campaign Pack that includes the following. We have a corresponding FREE Launch Template Course that goes with our free templates. Enroll to get started! Ready to learn the HubSpot Website Platform Basics? Our Campaign Packs give you everything you need to launch your next HubSpot campaign. They include an email, 2 landing pages, and a thank you page. These pages and emails are fully responsive and were created for increased conversion rates! Our Campaign Packs are used by people looking to quickly launch an effective campaign that will yield results. We have the most highly converting landing pages on the marketplace. Our starter packs are great to use for getting started with the HubSpot website platform. The packs include blog listing and post layouts, 2 landing pages, an email and a thank you page. You will get a feel for how easy it is to work within our templates and be able to dive right in to using them for your site or campaign. For our trial there is no free one on one support. We've had over a 1,000 downloads of our starter templates! Starter packs are typically used by people who are just getting started with the HubSpot COS or those who have a basic knowlege of the platform. Looking to get a site up quickly? Our launchpad packs are great for launching your next site. They include key pages necessary for deploying a new HubSpot website. People who use our launchpad packs understand that any site is better than their current site. Our launchpad templates are designed to rapidly deploy sites that can go live quickly and be updated in later phases using an agile approach. Our full packs include 50 + templates with a variety of layouts and style options, giving you a full inventory to pick and choose from and use in the future. We also offer a Free Custom Setup for all of our full packs. 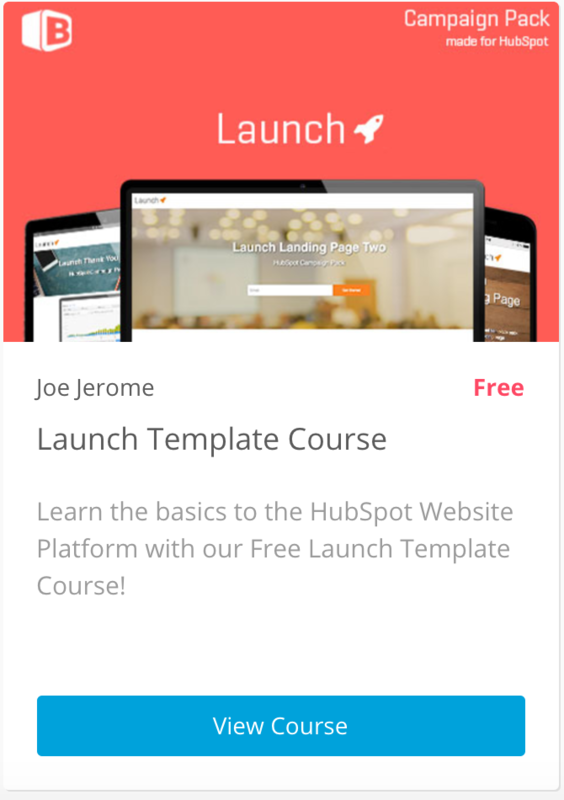 Get Started with our Free HubSpot Template Course! When you buy a template you get a team. Our Team has created a Free Hubspot Template Course that was designed to go along with our Free Launch Campaign Template Pack. Enroll for free to get stated! Our Custom Quote Builder will help you figure out exactly what you need for your new website project. You can do our assessment completely on your own.